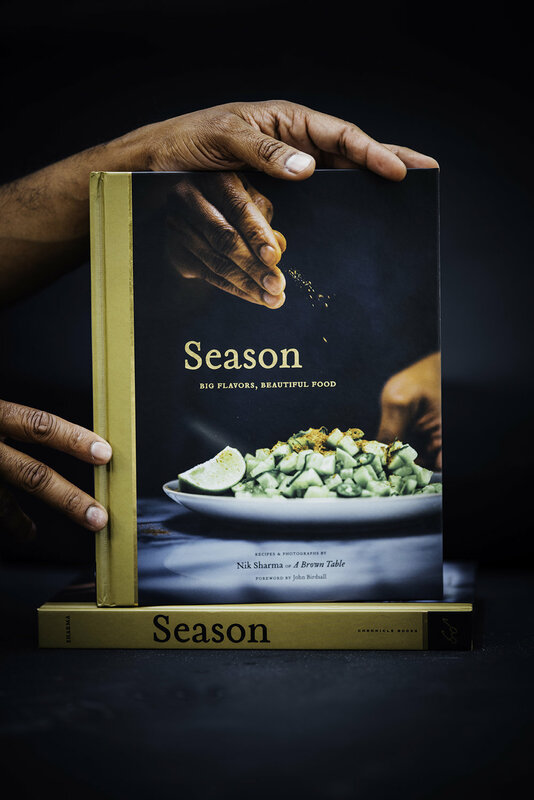 So far this year there have been a few books on pastry and desserts that blew me away, not just in terms of photography but also in the content the authors created and what I could learn from them. Stella Parks's BraveTart, the Ottolenghi Sweet and this book, that actually came out a year ago in Europe but just got released in the United States, The Artful Baker by Cenk Sönmezsoy. The Artful Baker as I mentioned is a visual treat but it's a lot more than that, as soon as I got a copy of Cenk book, I sat down and flipped through the pages marking things that I wanted to make. I think I could best describe them as artistically indulgent and experimental. He's got a whole set of brownie recipes that go from classic to elegant, like this one. In this version, a chocolate brownie is first layered with a layer of Valhorona Dulcey then decorated with a chocolate lace pattern. I skipped his design and opted for a chocolate mehendi pattern that I stenciled out on butterpaper and then cooled. Once cooled, I flipped the design on to the white chocolate layer to transfer. But that's the thing with this book that I love, you can take his ideas and suggestions and make them your own. Then there was a recipe for a raspberry jewel pluot galette (I wish this was next year and plum season), the Monte Bianco (which is a spectacular display of chestnuts cooked to create a spaghetti like shape),or the Devil Wears Chocolate Cake or the Pomegranate Jam. There's so much stuff to choose from, you'll be baking and cooking desserts year round from this book. This week, I''m giving away one copy of Cenk's gorgeous book with an equally gorgeous plate (the one on the right below) created by his friend and artist, Tulya Madra. All you need to do is leave a comment below and tell me what your favorite dessert book of 2017 has been. The giveaway is open to US residents only (due to shipping reasons) and will run till November 14, 2017. I will announce the winner on this page on the 15th and contact them by email (so please don't forget to use your email when you sign up to leave a comment). Good luck and happy cooking! 1. Stencil out the design on a sheet of paper and then stick a sheet of butterpaper cut to size. 2. Using a cornet/paper cone (Serious Eats has directions) fill it with melted chocolate as prepared in Cenk's recipe and then use that to trace out the design. Let this sit in a cold place to let the chocolate harden. You can also refrigerate this. 3. Once hardened carefully flip this on the white chocolate ganache layer and carefully peel so as not to break anything. If it does, if your design is intricate, it can be salvaged by moving the pieces together using a small parking knife or fork. Set a rack in the middle of the oven and preheat the oven to 350°F (175°C). Butter the bottom and sides of an 8-inch (20.5-cm) square baking pan. Line the pan with two overlapping strips of parchment paper that are the width of the pan bottom and long enough to cover the bottom and sides with 2 inches (5 cm) of overhang on each side. Butter the lower parchment to secure the top sheet. In a medium heatproof bowl set over a medium saucepan filled with 2 inches (5 cm) of barely simmering water, melt the butter and chocolate, stirring occasionally with a silicone spatula. Remove the bowl from the pan and let cool completely, stirring occasionally. Sift together the flour, cocoa powder, and salt into a medium bowl. In the bowl of a stand mixer fitted with the whisk attachment, beat the eggs and sugar at medium-high speed until the sugar dissolves and the mixture is pale and thick, about 4 minutes. Add the cooled chocolate mixture and beat at medium speed until blended, about 30 seconds. Add the flour mixture and beat at the lowest speed just until incorporated. Remove the bowl from the mixer and scrape down the sides with a silicone spatula, reaching down to the bottom to incorporate any unmixed dry ingredients. Scrape the batter into the prepared pan and spread it evenly with a small offset spatula. Bake until a paper-thin crinkly crust forms on the surface of the brownie, about 25 minutes. A wooden toothpick inserted into the center should come out with thick, gooey batter clinging to it. Set the pan on a wire rack to cool completely. As the brownie cools, the center will sink slightly. Using the parchment overhang as handles, lift the brownie out of the pan and transfer it to a cutting board. Cut the brownie into 3 or 4 equal strips in each direction to make 9 or 16 squares. Using the parchment overhang as handles, lift the cooled brownie out of the pan and transfer it to a wire rack. Level the top of the brownie with a large serrated knife and return it to the pan. To make the ganache, put the chocolate in a medium heatproof bowl. In a small saucepan over medium heat, bring the heavy cream to just below a boil, stirring frequently. Take the pan off the heat and pour about half of the hot cream over the chocolate. Stir gently with a silicone spatula until blended. Add the rest of the hot cream, stirring gently until the chocolate melts completely. Scrape the ganache over the brownie and spread it evenly with a small offset spatula. Refrigerate the brownie, uncovered, until the ganache is firm, about 2 hours. Lift the brownie out of the pan, carefully peel away the parchment, and transfer it to a serving plate. Press lightly on the ganache with a large knife to mark the brownie in 3 equal strips in each direction. These will provide your border guides for the chocolate lace decoration. To make the chocolate lace, fit a small pastry bag with an extra small (1-mm) plain round tip (Ateco #261), twist the tip of the bag, place it in a small glass, and fold the top of the bag down over the edge of the glass.